This article was written for CBSNews.com by Muni S. Jaitly. Dogs may be better friends than we think. Scientists from the Broad Institute of Harvard and Massachusetts Institute of Technology announced last week the successful high-density sequencing of the dog genome. The genome sequence was published in the Dec. 8 issue of the journal "Nature." Many geneticists believe the dog genome, in comparison with the human genome, will shed light on how dog and human diseases work. Studies could lead to new treatments of diseases like cancer and diabetes. The human genome was sequenced in 2003. Dogs, after humans, suffer from the second greatest number of inherited genetic diseases in mammals. The canine genome is an ideal model for studying genetic diseases in both dogs and humans because so many of the diseases overlap. "With the click of a button we can go to a chromosome, sub region or gene. From human to dog," said Dr. Elaine A. Ostrander, chief of the Cancer Genetics Branch at the National Institutes of Health. She is also co-editor of "The Dog and Its Genome," published by Cold Spring Harbor Laboratories Press. A genome is like a recipe. It is an organism's complete set of deoxyribonucleic acid (DNA). DNA is the chemical compound in an organism that carries genetic information — the molecule of heredity. Genes are regions of DNA passed on from parent to offspring. In dogs, DNA determines traits like coat color, limb strength and disease susceptibility. Dr. Martin L. Katz, professor of ophthalmology at the University of Missouri-Columbia, compared genes and genomes to books in a library. "You look for a book, read it and master it. Then you compare two books from different libraries word for word and tell the differences," he told CBS News. The difference between genomes of a healthy and unhealthy organism can determine disease. Once the genes responsible for disease have been identified, researchers can perform one of two procedures on the organism: gene replacement or gene repair therapies. Both therapies are like fixing a car: you can get a new engine or simply fix the old one. In gene replacement therapy, an artificial gene, without the disease-causing mutation, replaces the disease-causing gene in the cells of the organism. In gene repair therapy, geneticists try and repair the mutation within the gene. Gene therapy has shown promising results in dogs. In one case, a missing gene was re-inserted into a blind dog's eye. Soon afterwards the dog could be seen catching a Frisbee. Years from now, gene therapy procedures could be standard in human patients. "We're optimistic," said Dr. Ostrander. Of the world's 5,000-plus mammals, dogs are quite possibly the most diverse, from Labradors and Dalmatians to Great Danes and beagles. The sequencing of the dog genome will enable scientists to not only find genes responsible for genetic diseases, but those responsible for many other dog traits. For example, why are certain breeds more aggressive? The dog genome was sequenced using sample DNA from a boxer named Tasha. Boxers are believed to be the one of the most inbred dogs in the world, meaning Tasha had fewer differences between chromosome pairs. This allowed for faster and easier sequencing. Dr. Gordon Lark is distinguished professor emeritus of biology at the University of Utah. His research focuses on the genetic architecture of the canine skeletal system. Studying dog genetics, Lark said, has some terrific advantages. "It's not like rats in a cage." Scientists do not have to incur heavy costs of dog maintenance (like housing and feeding the dog). Owners readily treat dogs like humans. They take their dogs to the doctor, play with them and bathe them. Considering the numerous dog shows and meticulous practices of breeders, owners in the dog community are arguably the most active and cooperative of any pet community. 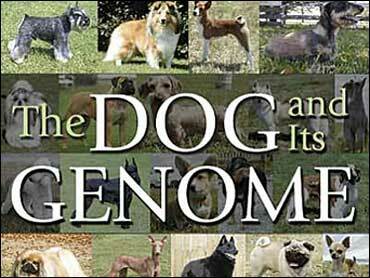 "There is no way that dogs and dog owners cannot benefit," Lark said concerning the completion of the dog genome. Aside from performing gene therapy procedures, scientists will soon be able to find quick and easy tests for genetic counseling. Ultimately this would enable breeders to eliminate unwanted genes from dog populations. "With genetic counseling we will be able to give a probability: you do or do not have the chance of disease in offspring. What a relief to know it's not a worry," said Lark. Ostrander says this is an exciting time for those studying comparative genomics, the study of genomes from different organisms. What's next? The high-density sequencing of the cattle genome could have a huge impact on the agricultural community with implications concerning milk production and disease susceptibility. "I can see that having an impact," said Ostrander.